This post is dedicated to all those of you who live in New Zealand and want to learn to play bridge. 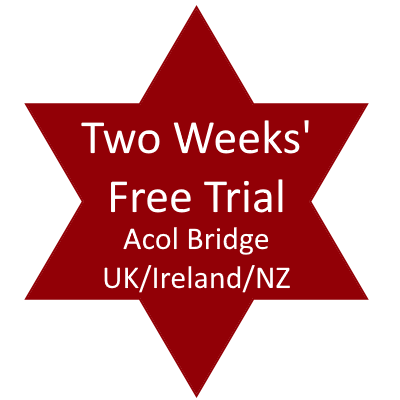 There are several systems of bridge, but the most commonly played system in New Zealand is Acol bridge – the same system that is played in the UK and Ireland. If you want to learn to play Acol bridge online, look no further than No Fear Bridge – the world’s leading Acol bridge teaching website. If you want to play bridge online against robots, or other players worldwide, you might choose to learn American standard bidding. Fortunately there is a No Fear Bridge US site. Whichever system you choose to learn first, you will find that it isn’t too hard to convert. Once you’ve learnt and understood one system it is relatively easy to learn the differences. If you’d like to find a local class, where you can make new friends and learn bridge at the same time, take a look at the New Zealand Contract Bridge Association website – http://www.nzcba.co.nz/ They have a list of local bridge clubs, many of which run classes. If your local club doesn’t run classes they will probably be able to put you in touch with a local class or teacher.